HOBBS, NM�OCTOBER 11, 2015�At the end of Zia Park's 400 yard Hobbs America Futurity Sunday afternoon the camera could not separate Game Changes and Miss Feet Down First. The pair of two-year-olds hit the wire at the same time and will share a winner's purse worth $95,307 each. Burns Folly finished a neck back for the show ticket. Miss Feet Down First and Game Changes were clocked over the 400 yards in :19.918 seconds into a 10 mph headwind. Carlos Alvidrez saddled Miss Feet Down First for owner Esequiel Porras. The filly by first crop sire DOMINYUN was bred in Texas from the Rainbow Futurity(G1) winner Feet Down First, by First Down Dash. Her record stands at (7) 3-0-2 with a bankroll of $104,442. The entered the Hobbs trials off a win the All American Futurity(G1) trails at Ruidoso Downs in August. The sorrel filly has now strung together a three-race winning streak. Oscar Cordova had the riding call. Getting his fourth win of the season, Game Changes was fourth in the All American Juvenile Invitational at Ruidoso Downs in his prior start to winning his Hobbs America trial. Umberto Belloc conditions the Louisiana-bred. 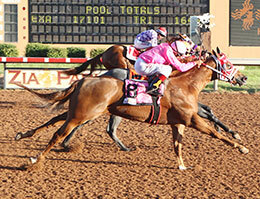 Owned by Martin Ybarra, Jr. and ridden by Larry Gamez, Game Changes record stands at (7) 4-1-0 with $125,560 earned. Noel Balderas is the breeder. After suffering his first loss in his last four starts Burns Folly had to settle for the show check of $23,572. Chris Zamora saddled the gelding for owner Alberto Villanueva. Jaime Leos was aboard the Burnett Ranches, LLC Texas bred . With a (6) 3-0-1 record the sorrel has earned $37,172 this season. Completing the Hobbs America Futurity(G2) field were Silver Tarzan, Apollitical Ok, Ebw Catalyst, Seis Me, Boss Regard, Queen Arabella and T Tornado Seis.